Quick sms lets you send a fast broadcast to up to 50 numbers that you type or paste from elsewhere. To send out quick messages, follow the steps below. Select “Quick SMS” in the drop down menu. Next, type or paste the mobile numbers that you want to send sms to. They can be in any format. Ex. (255784XX, 0784XXX or 784XXX.) 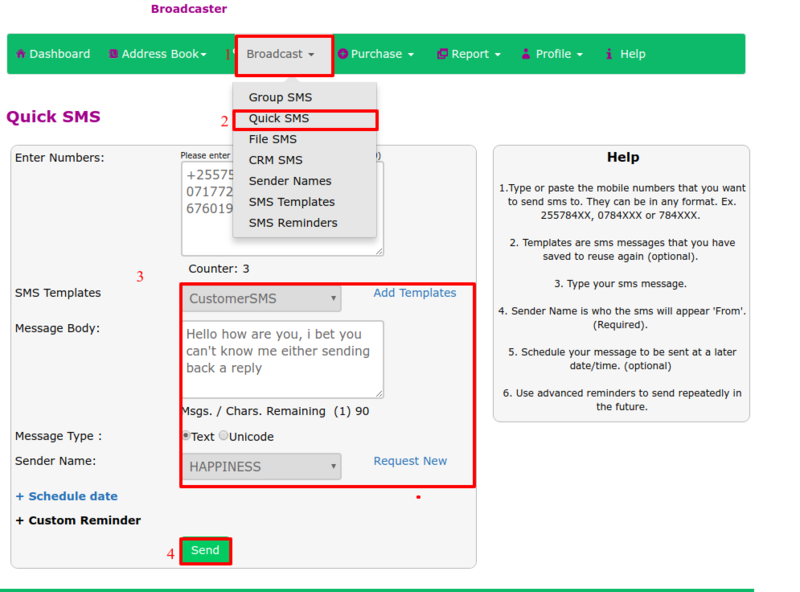 add your templates (sms messages that you have saved to reuse again) this is optional, select your Sender Name. Sender Name is who the sms will appear 'From'. 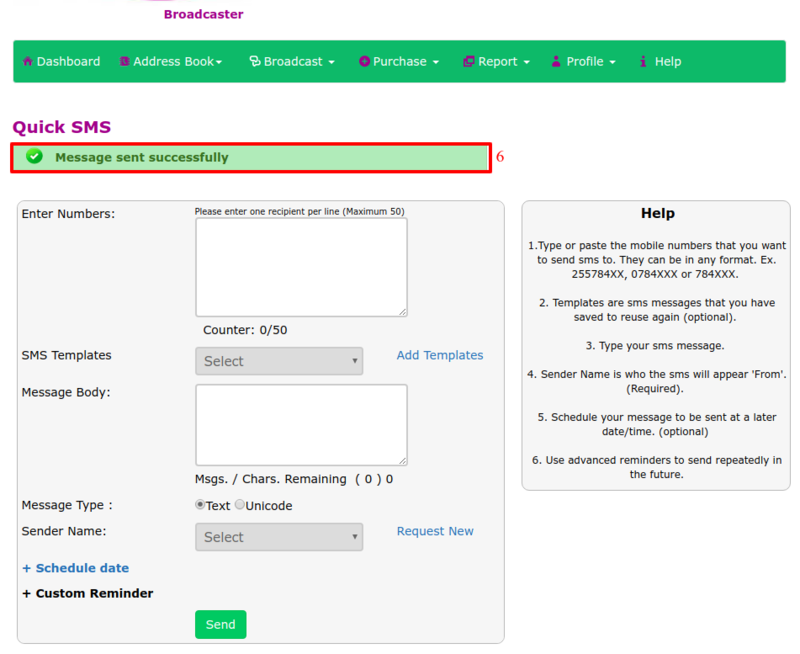 (Required), templates are sms messages that you have saved to reuse again (optional). You can select a template if you have one. This will populate the message body with the template. To create a template follow these steps. Type your sms in the message body. The character count will show your how many characters are left per sms and if you have crossed into multiple sms. Note each sms is 160 characters for the 1st sms and 153 characters if longer than 1 sms. The UNICODE flag will be highlighted if there are UNICODE (special) characters that the system does not allow detected in your message body. You can also use advanced reminders to send out SMS repeatedly in the future. Select “Custom Reminder” configure these reminders. Before the sms is sent, you’ll need to confirm that your sms and credits counts are accurate. One credit is the same as one sms (see sample below). 6. You will get a notification that “Message sent successfully” as seen below.